As the image suggests, it is an enforced protection between your computer and the rest of the world. There are both hardware firewalls and software firewalls that you can implement on your computer system. It is most likely these days that you have a Network Address Translation (NAT) router sitting between you and the Internet. NAT routers are probably all you need in the way of a firewall. With a NAT router, computers on the Internet cannot connect to your computer unless you have already made an outbound request for them to do so. An outbound request, for example, is when you use your browser to load a web page. You have made a request of a computer on the Internet to deliver this page to your computer. If you do not make such a request, your router will deny its access and basically toss it to the wind. This is a very secure system and protects you from the bad guys that are trying to gain access to your computer and any others on your local network. There are many, myself included, that say, “If your computer is already compromised, any further protection becomes a moot point.” My case is simple– if you already have a Malware intrusion, your system is no longer protected by anything. Your layers of protection have already failed you and need to be re-thought. It needs to be fixed. Now. No amount of further scans with the same or other programs will ever get you a 100% guarantee of system “cleanliness”. A complete re-install of the Windows OS is the only option. It’s the plain ugly truth. Sorry. A software firewall, such as the bundled Windows Firewall, goes one step further. They monitor outbound requests, and if they don’t recognize the program making the request, they will prompt you for permission to allow it. If you don’t allow it, the router will never know about it. Remember, this happens before the request gets to your router. If the router doesn’t get a request from your computer, it will deny any response from the outside. They became expensive. Even the free versions became a real pain in the neck to use. 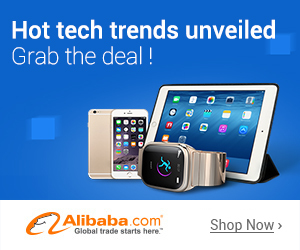 They started throwing up distracting ads in the form of pop-ups in an on-going attempt to sell me things I did not want. They inundated you with warnings about this and that– many of which were cryptic and hard to understand. Now, instead of just slowing down my computer, they were slowing me down as well. An aside: Anti-virus programs are taking the same ill-fated path but short of disconnecting the Internet, I have yet to find a solution for this creeping crud. I ultimately decided it wasn’t worth the agony and chose to use only my NAT router and the basic Windows Firewall, and a free Anti-Virus solution (I use Avira at the moment but that is going to change soon- they, too, are annoying me to no end with lengthy scans I can’t control and pop-up advertisements with their so-called “Premium” offerings). My life has become much simpler and I like things simple. Incidentally, since I made this decision, my computer has yet to be compromised by unrequested malicious viruses, malware, Trojans, or any other form of junk. Several years now so I rest my case. 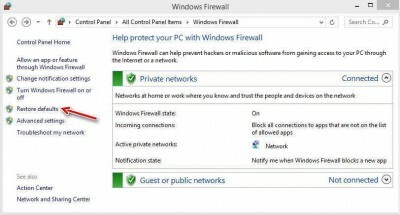 Windows Firewall will throw up a complaint about a program on your system asking for Internet access. You will allow it because you know darn well that is what you want. Six weeks later, or months, you find out that trusted program should not have been your buddy in the first place. You don’t remember that you told Windows it was OK. Now you have an inaccurate and bad entry in the Windows Firewall rules database. You un-install the offending program. Just because you un-install the naughty program does not necessarily mean it is truly gone. It may still be running in the background somewhere performing its mischievous deeds. We all know this from our past experience with the way Windows works. Adobe products are a great example. I challenge you to fully un-install a copy of Acrobat Reader. Good luck with that! Note #2: For the young in this audience, two-bits equals 25 cents (US). You have now entered the major leagues and will, with no guarantees from me, glean respect with all its potential rewards from your elders due to this new-found knowledge. If you find yourself in this undesirable situation, you have a couple of options. 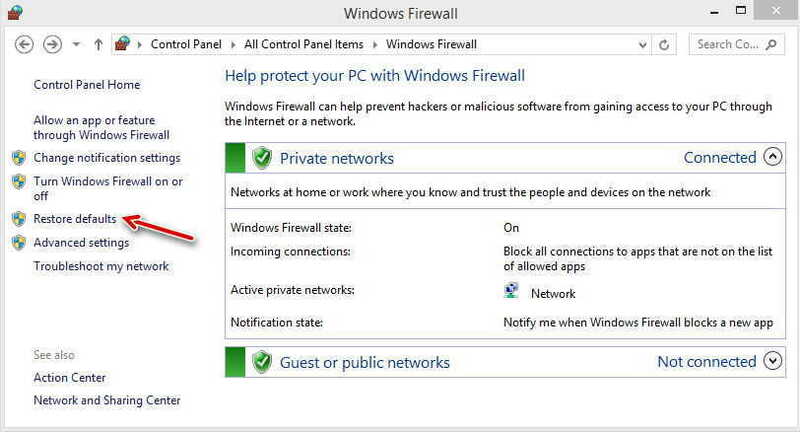 One is to go through all the rules you have changed to alter the Windows Firewall’s behavior. Depending on the unfortunate decisions you may have made in the past, this can be sheer drudgery. The other choice is to simply reset all the rules to their default settings. Please note that by doing so, it may break some of the applications you are using in which case you will have to once again tell Windows that it is OK for that particular program to have access to the Internet. That should not be a big problem unless you have gone totally wonkers and allowed Internet access to tons of programs you probably should not have in the first place. Note for the uninitiated: “totally wonkers” is a scientific expression usually only shared among society’s intellectual elite. Cough. In the Left Panel of the window that opens, choose Restore Defaults – You will receive a warning notifying you that this will remove all the settings you have changed and may cause some of your Apps to stop working. At this point, I’m guessing this is probably what you want, so click the Restore Defaults button. If you have run into problems along these lines I will be the first to say that it is unusual. However, it is always nice to have the ability to immediately reverse the silly decisions we may have made along the way, especially when you consider not having to face the daunting task of re-installing the Windows Operating System. Whew!